Many marketers find tracking the ROI of their video campaigns to be tricky, but that is often the result of poorly developed strategy and improper goal-setting. Broadly speaking, all video marketing will be looking to do one of three things: build brand awareness and trust, increase sales, and educate and inform your customers and potential customers. Although there will inevitably be overlap between those broad objectives (in the end, all marketing ultimately hopes to increase revenue), you must first define what you want to achieve. If you plan to produce content that targets all three objectives, then think about how you can segment your content and assigning a weight to each metric accordingly. Once you’ve decided what it is you want your marketing film to achieve, then you can start thinking about how to properly measure success. Here are 10 essential video marketing metrics that fall into one of three broad measures of success. Views are one of the easiest metrics to track—and one of the most misleading. Tracking views gives you a very basic idea of how many people are clicking play on your content, but that’s about it. Play rate gives you more context by dividing views by unique and returning webpage visitors. By showing what proportion of visitors clicked play on your video, this metric is a strong indicator of the effectiveness of various elements, such as video thumbnail, accompanying text, and page positioning. It still doesn’t tell you anything about engagement, though. Unlike views and play rate, watch time hints at engagement levels, and this is a far more valuable metric in establishing ROI. By monitoring how long people are watching your video, you can conclude how many are seeing your CTA (depending on how far in it appears) and, by extension, how effective that CTA is. More generally, watch time will tell you how watchable your brand film is and at what point people are losing interest, which is useful data for producing new content. Social media shares are one of the most obvious and easiest ways to track engagement. Of course, advertising, promotion, and PR also need to be taken into account to accurately establish relative success. A video that’s been shared 1,000 times may appear more successful than one that’s been shared 100 times, but if you’ve pumped significant sums into promoting the former and nothing into the latter, the results aren’t necessarily cut and dry. So far we’ve talked about quantitative data, but there’s a significant role for qualitative data, too. Commentary and feedback on your videos can vary wildly, from high praise to downright mockery and brutal critique. Consolidating feedback information and trying to gauge general sentiment can be useful in assessing how your content has been received. But such anecdotal information comes with a warning: In general, certain people are more likely to comment than others, which you’re getting only one slice of public opinion. The sentiments of the remainder could be very different indeed. Good brand films will travel, whether that’s through social media shares or links to them on blogs, forums, and other platforms. Backlinks are a strong ranking signal to search engines, including Google and YouTube, so although garnering backlinks might not be your goal, they are a strong indicator of ongoing success and exposure. The availability of heat map software will depend on where people are viewing your video and your choice of hosting platform (more on that later), but, overall, heat maps are possibly one of the most insightful tools for assessing engagement. 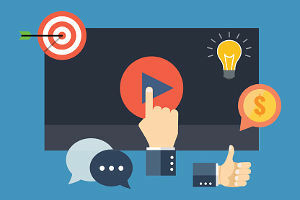 They can give unique insight into user behavior, such as whether users scroll while a video is being played. Depending on the goals of your campaign, CTR is perhaps one of the most important metrics to monitor. Strong CTR will be driven in large part by the efficacy of your video’s CTA, so keeping a close eye on the former will allow you to judge how and when to make improvements to the latter. Often, however, the primary goal of branded video content is to drive brand exposure and trust; accordingly, CTR may prove a redundant or less telling statistic. Ultimately, the purpose of all marketing is to increase inquiries and sales; and so, in order to measure ROI, any increase in sales should be tracked. Of course, tracking sales and inquiries is one thing, but attributing an increase in this metric to your ongoing video output is another thing entirely. However, there are methods of establishing correlation by, for example, asking customers how they discovered your brand and using tools such as conversion tracking in Google Analytics to track customer journeys. Although it’s not a metric, I included A/B-testing in this list because honing your video content and calls to action is an ongoing and evolutionary process, and A/B testing is one of the most powerful marketing methods to use on that journey. When you closely measure and analyze many of the metrics listed here, A/B-testing allows you to compare efficacy and make tactical tweaks to your content to improve retention and engagement. Over the long term, it can also help you develop better insight into what kind of content your audience responds to. I want to end with a quick word on choosing a hosting platform for your videos. This subject is worthy of its own article, but it’s worth mentioning here because opting for a paid hosting service can unlock new metrics and integrations that will give you a deeper knowledge and understanding of your video marketing. For many people, YouTube or Vimeo will be the perfect platform, allowing you to embed content on your site and access basic analytics. YouTube is owned by Google, and so it has by far the greatest reach via organic search. But if you are looking for more control, improved reliability, CRM integration, and better analytics, then services such as Wistia, Sprout Video, Vzaar, and Vidyard are worth considering. Vimeo also has a paid option, but if you’re serious about your video marketing, then the services I’ve just mentioned provide more-robust choices.